Love it, or hate it, or maybe both, PlayerUnknown’s Battlegrounds (or PUBG) was one of the breakout titles of 2017. Currently available for Xbox One and squeaking in a final 1.0 release for PC just before Christmas, with over 25 million players, the game has been a massive success. Since that time, as you can image, a lot of games have been played. As such, the developer has released figures showing what has gone in the game and most importantly, that 130 million chicken dinners have been won. The stats come just days after PUBG reported that over a million accounts were banned in January. For those not aware, if you are the last man standing in this battle royale game, aside from bragging rights and some in-game currency, you are greeted with the congratulations ‘winner winner chicken dinner’. Therefore, what that statistic means in that there have currently been 130 million rounds of PUBG and, by proxy, 130 million winners. Sadly, I can confirm, that I have never won a chicken dinner. In the reported statistic, there are also a lot of other interesting factoids about PUBG. For example, the most popular vehicle is the UAZ, following very closely by the Dacia. Over 13 million players have been killed by the frying pan (which is surprisingly powerful). Over 3 million concurrent players were reported and finally, that the M416 is the most popular weapon with over 55 billion equips. 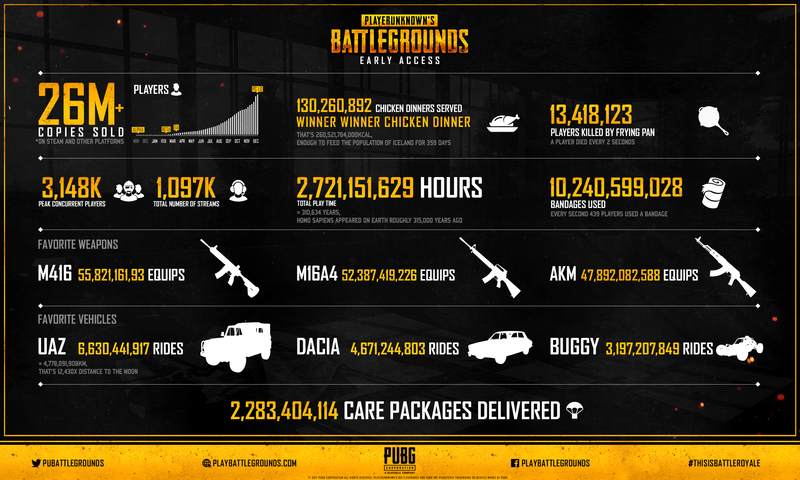 The stats are definitely interesting and if nothing else show just what a massive success PUBG has been. I play it occasionally myself, albeit very badly. They, unfortunately, didn’t have the statistics for time spend hiding in hedges and grass, but doubtless, I would have added a significant chunk to that. What do you think? Do you play PUBG? What do you think about the stats? Have you ever won a chicken dinner? – Let us know in the comments!